Here's something I thought I would never type: It's so hot here that my toe nail polish melted off! It really did! I smell good for about 10 minutes after my shower...then...I think did I just take a shower? Our team was not able to get to Peredo to start on the Health clinic there because the river is still too high to cross. Some Haitians are getting out of Peredo by riding on the shouldes of another person walking through the river that is over their head! Even I thought this was a little too adventurous! We held clinic Tues-Thurs at Emmanuel Christian Church in Port-au-Prince. We saw 252 patients in those 3 days. There were 3 Cuban trained doctors working with us. We had 4 different language barriers to work with: English, French, Spanish and Creole. It was just a little confusing but it all worked out somehow. There were 2 interpreters for the whole place. The cost for the people was about $0.50 US. This included seeing the doctor and any meds they prescribed. We saw anything from skin infections to upper respiratory infections to a large umbilical hernia on a baby. 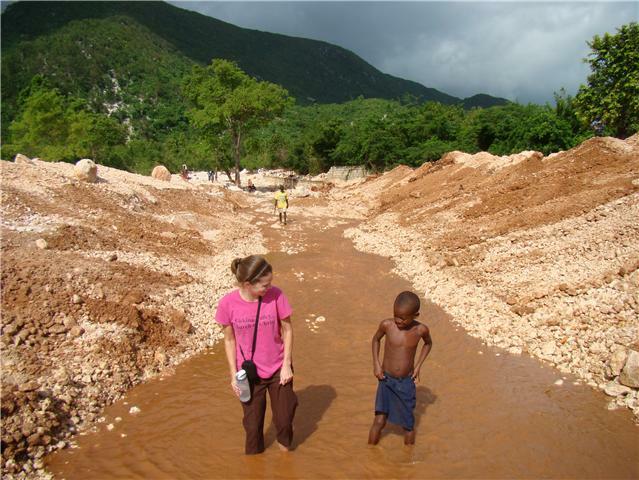 The Haitian people really appreciated the clinic. This clinic will now be open one day a week. I am so excited about this because now we can do follow-ups for patients where as before we were prescribing people blood pressure medicine and had no way for them to come back and have it rechecked. We can also keep a close watch on malnourished children, pregnancies and chronic illnesses. The school that is on the same property at the clinic is not in session yet b/c of the hurricanes. The start date has been pushed back one month. I was excited to hear that I am going to be coming into the school when I return in January to teach English and health education to the kids there. I am secretly hoping the kids will teach me Creole! I learned some this week but have a long way to go. We are sightseeing in Haiti today (although everyday has been a sight!). The team from Indiana leaves Monday so please pray for travel safety for them. I have had so much fun with them and made many memories that I will never forget. Some of them are considering coming back to Haiti and I hope and pray that they do. Thank you for your prayers and emails of support. What an amazing thing you are doing, Ginny! Thanks for updating on your experiences. It is so interesting to read about!